I started with 2 lbs of chicken. I mixed 1 tsp of Cornstarch, 2 tsp of Soy Sauce, 2 tsp of Dry Sherry, 1 TBSP of Sesame Oil, 1 TBSP Peanut Oil, 1 tsp water, dash of salt, pinch of pepper, mix well. Dip each chicken breast in mix and coat both sides. Place in dish, pour remaining marinade over chicken. Merinade for 10-20 minutes. Cut up 2 cups of Shiitake Mushrooms, minced. If Dried, soak in boiling water and let stand for 30 minutes. Peel and then mince 1 TBSP Fresh Ginger root, 3 cloves of Garlic, 3 green onions, 1 large dried Chili (reive seeds for a milder spice), 1 – 8 oz can of Bamboo shoots, 1 – 8 oz can of Water Chestnuts. Prepare 1 package of Cellophane Chinese Rice Noodles per instructions. 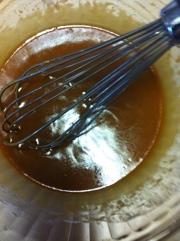 Mix together with a whisk and then set aside. Slice Chicken into small cubes. Heat 1 Tbsp Vegetable Oil, 1 Tbsp of Peanut Oil, 1 Tbsp Sesame Oil over Med-High heat. Sauté Chicken in Wok for 3-5 minutes. Add 1 additional Tbsp of Peanut and Sesame Oil each. Add Ginger, Garlic, Chilies and Green Onion. Sauté for 1-2 minutes. Add mushrooms, bamboo shoots and water chestnuts. Sauté for another two minutes. Add cooking sauce and mix well. Allow sauce to thicken. Break cooked Cellophane Noodles into small pieces and pour chicken mixture over the top of the noodles. Spoon into lettuce leaf and roll up like a taco. They look wonderful! How did they turn out? They were pretty good. The taste was pretty close, the noodles I got were not the same as the ones I wanted but next time i’ll try a specialty store to find them.